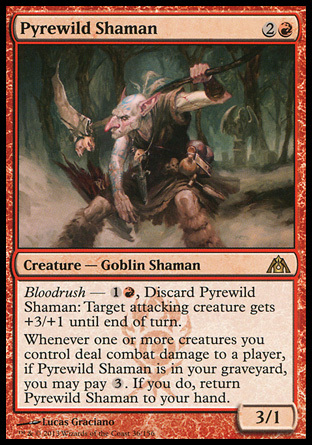 Pyrewild Shaman is one of the new Dragon’s Maze cards that has piqued my interest and is one that I’ve been testing for possible inclusion in Mono Red. He was one of the few red cards on the spoiler to catch my eye as a possible Standard-Playable, and I’d like to go over what I think are the pros and cons of running him. His Bloodrush ability has the potential to cause blowouts in aggro vs aggro combat or situations where you need to kill a flashed in Restoration Angel. His Buyback ability is potentially valuable against control decks like UWR and Esper, especially if you can afford to do it the same turn you Bloodrush him. He’s reminiscent of the days where Red had Hammer of Bogardan, and in this case I think the Bloodrush is a lot more favorable than the 3 Damage. Mono Red doesn’t have a lot against the control decks aside from speed, so this guy could potentially add just enough value to increase percentage points in matches. He’s three mana, and this deck already has Pyreheart Wolf and Boros Reckoner at the 3cc slot, both of which are better cards most of the time. His Bloodrush ability does change his CC slightly when being considered but at the end of the day he’s a 3/1 for three mana. His Buyback ability only triggers when you deal combat damage to your opponent, meaning you should already be hitting them for damage. I could see a lot of post Supreme Verdict or removal heavy board states where you simply have him sitting in your graveyard not helping you win the game. He’s no Chandra’s Phoenix. Lastly, is there room for him in Mono Red? It’s really a tough call as at least in the case of my list I don’t have a lot of space to play with. He could potentially replace Thundermaw Hellkite as getting to that five drop is really inconsistent, or he could replace Skullcrack in the board which has not been a card that typically helps me in a lot of matchups. I could also miser him for x1 Boros Reckoner in the board, another card I’ve been shuffling on whether I should play or not. Won the Standard Format Gameday yesterday, went 3-0, ID’d into top 8, then won my next 3 rounds to take it down. 16-2 overall this week with Red Deck in tournament play and 31 packs won. Game 1 I have a slow opener with Stonewright, burn, no two drop, Pyreheart and Hellrider. He has a strong reanimator open using Grisly Salvage to enable a turn 4 or 5 Unburial Rites into Angel of Serenity. He adds some more guys to the fray and has a Vault of the Archangel out. It looks all but over and I’m almost ready to scoop but he’s at five life so I stay patient. He swings in with too many guys, doesn’t activate Vault instead electing to play another creature, and forgets about the Pyreheart trigger. I swing back for lethal. Game 2 he loads up the board quickly with Voice of Resurgence, Thragtusk and Restoration angel against my otherwise aggressive start. I bonehead misplay and cast burn during his turn triggering Voice to give him a free 5/5. Scoop from there. Game 3 I’m on the play and I kill him on turn 4 before he can get anything online. Both games I burn out all his guys and overrun him with Zealots and Hellriders. He also gets stuck on two lands game 1 which doesn’t help an already backwards battle. Unfortunately Pat is a good friend of mine and we have to play, I can’t remember the details too well. I think game 1 he was able to get an Omniscience into play but was hoping for something better like Angel of Serenity. Both games went by quickly, I think Pat had some good cards in the yard in game 2 but was stuck on lands or something. We played a few more after and I won most of them but there was one fun game where Pat got triple Angel of Serenity in play and a Dinova Horror to bounce my land keeping me off Thundermaw AND gave them all haste. Yep I died in that one. We ID’d, both of us have played each other a lot and there was no point in risking it with what can be a fairly close matchup (mostly due to Geist of Saint Traft). Game 1 I’m stuck on 2 lands but I play 2-3 one drops and 2 two drops to apply immense beats. He has maybe one removal spell and finally a Garruk Primal Hunter. He fails to draw a Thragtusk off of it though and three Searing Spears put the nail in the coffin. Game 2 I curve out and he gets stuck on lands with I believe only a Huntmaster to serve as a temporary roadblock. I can’t remember much of this match, I had plenty of burn for his guys both games and applied a lot of pressure. Won it pretty handily. He did have a Silverblade Paladin bond with a Geist Angel Token which was a scary moment, but I had the win in hand on my turn. Game 1 I curve out and burn off his guys, and have a Pyreheart Wolf followed by a Hellrider to ensure there will be no coming back. Game 2 was interesting. I played removal on his first 3 creatures, and had guys attacking. He plays a fourth creature (I think his third Flinthoof Boar). I have a Reckoner, a Hellrider, and a Searing Spear in hand. I was at 10 life and he has 2 cards in hand. 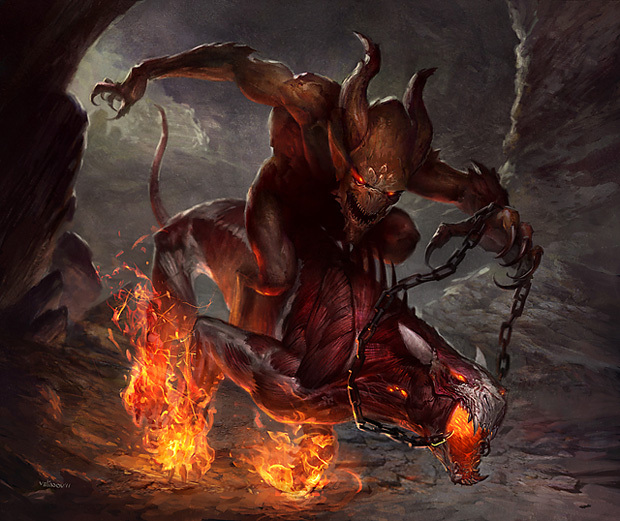 I elect to play Hellrider and hit him for 10, putting him at 6 thinking that there’s almost no way he has lethal unless he has the straight nuts (given what he’d already played) and would have to use any removal spells on Hellrider. I probably should have speared his Boar, as he punishes me with double Ghor Clan for the win. Game 3 I curve out into Hellrider with Thundermaw in hand and have burn for all his blockers. Skullcracks are also for the random Turbo fog matchups and Electrickery helps with Tokens, Bant Auras, and Naya Blitz. Electrickery honestly has been the strongest sideboard card all week for me, the fact that it doesn’t target when you overload it and its low mana cost has made it invaluable in comparison to Flames of the Firebrand. There are some decks where you may want access to both, but it’s surprising how many matchups Electrickery is just better. Over the course of the week there were multiple occasions where the card became a 5-for-1 and a 7-for-1 in games that I would have otherwise lost. Some might ask why I’m not running Volcanic Strength or Burning-Tree Emissary. In my experience, Volcanic Strength has been better in the aggro decks that have Burning-Tree as well, as they tend to explode with more guys on the table earlier to either catch up to a losing board state or create a winning one. Strength is much better on the play then it is on the draw, and it also requires you to play it carefully enough that you don’t get blown out by a removal spell which is an option that doesn’t always present itself in a lot of games vs. the mirror. In testing and tournament play, playing more removal has always been the better route, allowing you to control the board state, so maxing out on Mortars has just been easier to both deal with a pre-strengthed creature or anything in your way, not to mention the benefit of having x4 in the board against Loxodon Smiter. Burning-Tree can enable some explosive draws, but he also sets you up for a pretty bad supreme verdict in some matches, even if you try to play around it. At the end of the day he’s a vanilla grizzly bear, and while he is pretty nuts when you have the explosive draws, he doesn’t do enough in my opinion on a consistent basis to warrant his inclusion at this time. I played this deck with 20-land and 21-land Burning-Tree style for a long time and the consistency of the deck was not enough for me. One of the big reasons Mono Red is a good archetype in my opinion is the power and reliability of its draws, and the misnomer that people say it is just a mindless deck with no decisions to make is just not true if it’s built right and piloted correctly. Another card you might notice that’s a little different in the list is Rakdos Shred-Freak. I ran him over Lightning Mauler because the times when you get Mauler + a 3 Drop that you’re bonding with aren’t that often (more-so you usually bond him with a 2 drop to maximize the amount of early damage) and the times where your creatures get removed in response to you playing Mauler or he is the only creature you draw in a sequence can mean you’re missing out on critical damage. Most of your creatures have haste anyway, so the loss of being able to haste-up a three drop is negligible. Shred-Freak was definitely an improvement in this tournament for me at the current time, and that particular area of the two-drop slot is probably the weakest area of the deck to beginwith so you could run either card and most of the time he’s one of the first things you board out. Going forward, I like the list where it’s at but there are a few changes I want to make or consider. I would have liked to have a third Traitorous Blood for the matchups where you’re bringing it in, and Skullcrack is just seeming less and less necessary. There are the control decks that run x4 Sphinx’s Revelation that you want it against, but it’s not a card that I’m bringing in against Thragtusk. You don’t beat him by hoping to draw a crack and play it in sequence on the correct turn not to mention leaving mana up for it. It’s not that I’ve never won that way with it, but it’s again not consistent enough to rely on. It’s easier just to push damage around the lifegain. The games where your opponent has Trostani into Tusk, or some ridiculous stuff like that you’re probably already in deep trouble anyway. You lose out on furthering your board state when you save mana up to play crack, it’s a fairly awful topdeck, and its inability to remove a creature is a relatively big drawback. Really, the only reason it’s almost a must play is for the fog decks, which you can race a good portion of the time and then just burn out, but it can be a troublesome match without Skullcrack. That said, a 2-of in the board isn’t very reliable here either with respect to that. Archwing Dragon is a better card in the Jund and Bant matchups, as both decks have few ways to interact with him. He might also be relevant in the UWR matchups, although typically what I want against them is just speed. These matchups are all ones that require a lot of testing, which I’ve done with dozens and dozens of cards. There’s a lot of routes you can take and I would say just go with whichever route you are most comfortable with and make sure you have a gameplan. Be willing to accept a little variance over the course of many games and if you don’t get discouraged by that then you’re usually going to get the percentages which at the end of the day is what matters.